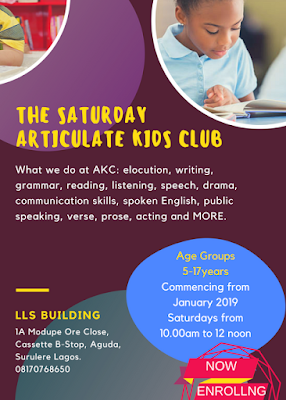 The DRS SATURDAY ARTICULATE KIDS CLUB is commencing from January 2019 Saturdays from 10.00am to 12 noon. At AKC Kids Club (ages 5-17) children are inspired to unleash their potential with activities in elocution, writing, grammar, reading, listening, speech and drama, communication skills, spoken English, public speaking, verse and prose, acting, and MORE. HELP YOUR CHILD FACE THE WORLD WITH CONFIDENCE. Call Damilola on 08170768650 to Enroll NOW! Quality supervision guaranteed.